First, I want you to notice the thermostat. Can you see that? From well below zero last night, the temps rose to 36 degrees! Wow! That means it is just about time to tap trees. 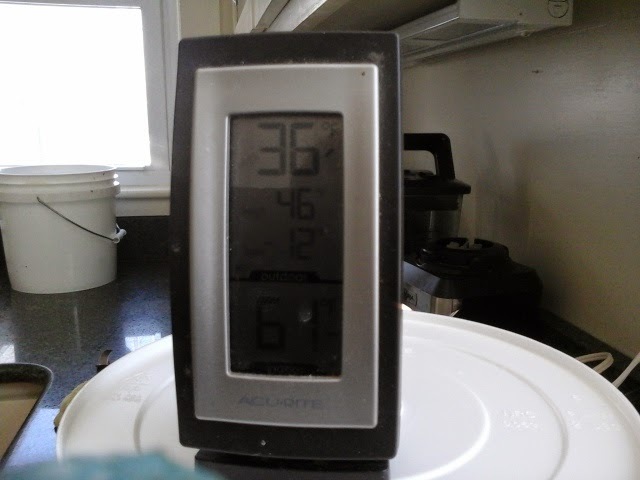 Usually, the daytime temps need to be above freezing and nightime below freezing. We havent had that yet, till today. It is still early, but I noticed the big sugaring operation down the road already has their taps in place. As to my vinegar project. I will call it a failure, and take the blame. My impatience to start the vinegar made me strain the juice before it had fermented enough. So tjere was still alot of live yeast, and once I transferred the juice to the vinegar bottle, that yeast continued to proliferate and produced a film on top. It is possible that this batch could be saved, but I tossed it and made a note how to do it better next time. I still need vinegar, so I started a batch the regular way, with fresh cider, and better sterilization. 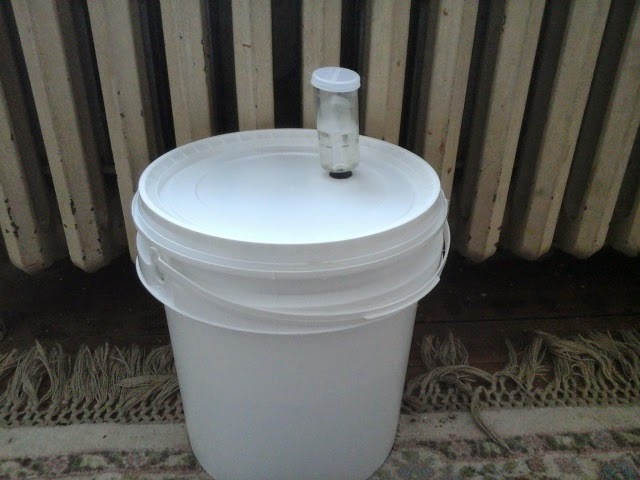 Here is the small fermenting bucket with airlock, sitting near the radiator, the only place in the house that might stay warm enough. 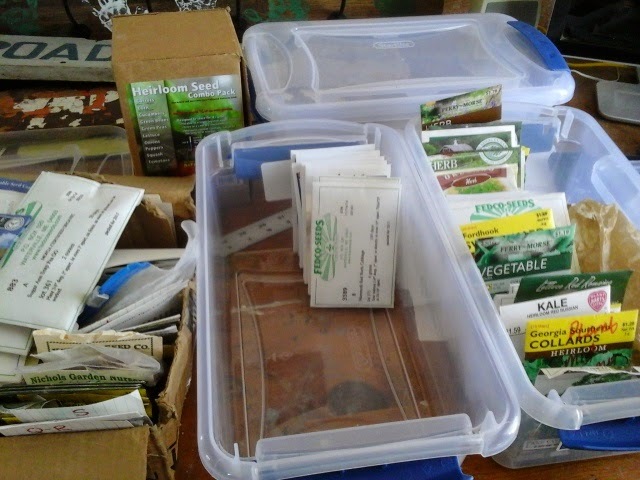 IT was obvious my box of garden seeds was way too small, and needed organizing. 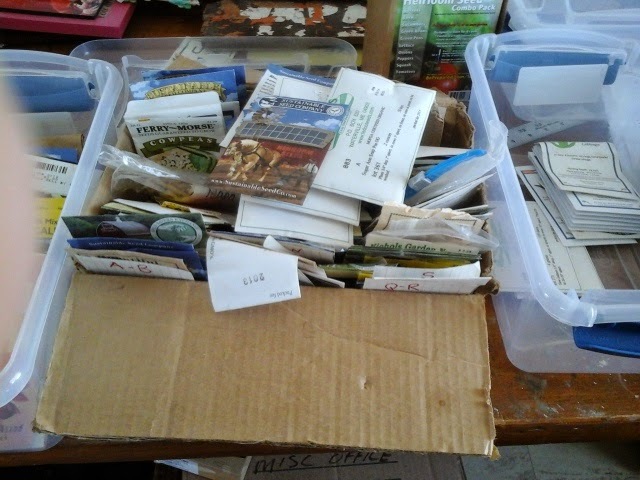 My method of sorting alphabetically worked, but I thought I could improve. I bought four tubs with lids (also good mouse protection) and now the question is, how should I sort them? 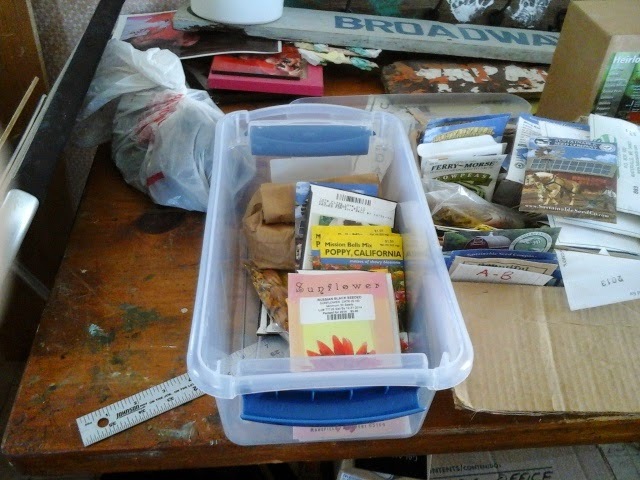 All the flower seeds go in one tub. That's a no-brainer . Greens go together in another. Yes, I have that many. That's lettuce, spinach, chard, collards, mustard, and I debated about turnips. Also in this tub will go herbs, like parsley, basil, oregano, and dill. My idea is that edible leaves as a general category might work. Most of the day was spent getting ready for grandkids visit tomorrow. Somehow in the move all the sheets disappeared for the spare twin beds, so I picked some more up, plus some "kid food" at the grocery store. Since we subsist mostly on beans and greens, I thought that might be too much of a shock to their system. I have to admit, I had real trouble buying packaged, processed food. In the end, I made an extra trip to the natural market for organic, grass fed meat and cheese. I simply couldnt buy the supermarket stuff. 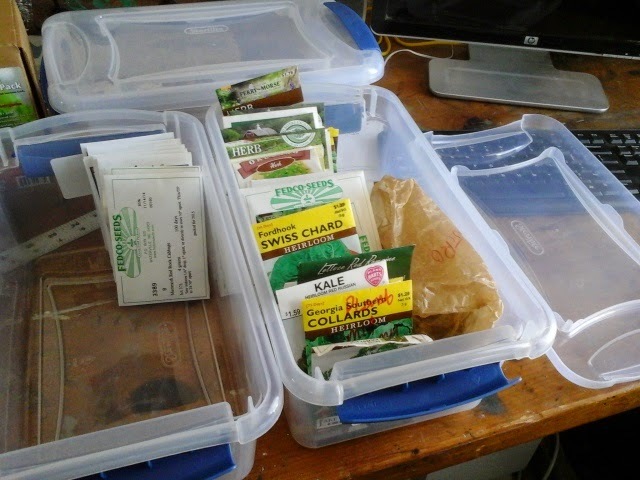 But I will let them pick a favorite snack food when they get here, and try to have lots of fresh fruits and veggies out. We are going to learn to make bread, starting with simple pizza dough. They wont know it, but it will be sprouted spelt flour for something a step above white refined flour.